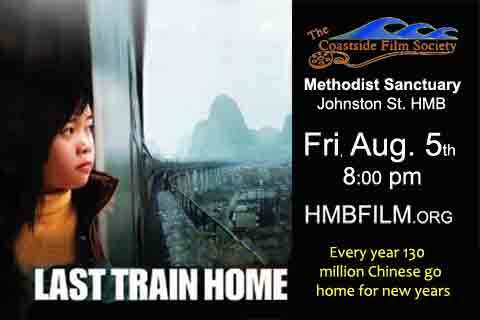 Film with a perspective on China any parent can appreciate. The Chinese industrial revolution is fueled by the labor of hundreds of millions of Chinese workers who leave home and family to take jobs in the factories that circle the big cities. Most of these workers get a single vacation each year - during the week-long celebration of Chinese new years. The result is the world's largest human migration, a week when an unfathomable 130 million human souls cram into every available mode of transport to grab a week of family time. The shots of this mad migration at the beginning of the Last Train Home are majestic and overwhelming. The bulk of the movie focuses on the life of one Chinese couple. Fifteen years ago Zhang & Chen left their young children in the care of grandma to take low-paying jobs in a factory a thousand miles away. They live in a dorm with no privacy, bent over sewing machines from dawn to dusk, to earn enough money to pay for a good education for their kids. Canadian director Lixin Fan follows the family for three years as the now teenaged kids gradually detach from the life goals their parent have set for them. Professor Jenny Lau, a Chinese film scholar at San Francisco State, introduced the Film Society to this masterpiece and will handle introductions and handle post screening discussions.